Utrecht-based (NL) initiative The Shape of Punk to Come has its fourth edition approaching fast. The young organization strives to present the best local bands on a quarterly basis and always invites a label or band to do a DJ-set. On October 23rd, Wasted Bullet is on top of the bill. Divine Sins will be releasing their new album and OTIS will be replacing The Maple Room. White Russian Records will be present with their distro and we’ll be selling The L.A. Journal #1. You can now win 2×2 by tickets. All you have to do is head down to our Facebook-page, find the below poster and tag yourself in it (it might help if you like and share it as well). Come hang out! 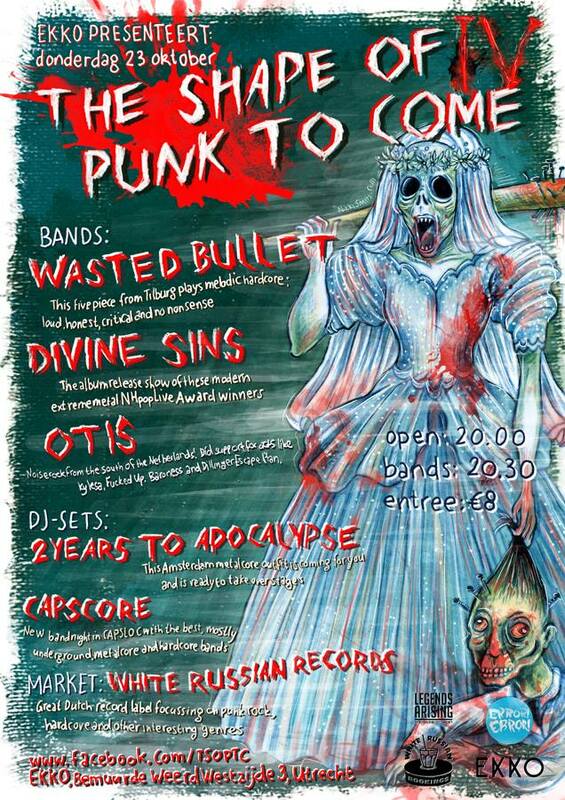 Tags: Divine Sins, EKKO, Otis, The Maple Room, The Shape Of Punk To Come, Utrecht, Wasted Bullet, White Russian Records. Bookmark the permalink.